Covered Call options are a great way to earn additional income from your stock portfolio. By selling stock options one can realistically earn 60% or more on their money a year. In order to learn the Covered Call strategy you have to become familiar with selling stock options. Selling is called "writing" in the world of stock options. I know, it would be so much simpler to just say selling, but as always, the financial community has to complicate things. So when you hear someone talk about writing Covered Calls they are just referring to someone selling a covered call. Before we discuss selling stock options, let me explain how Covered Calls work. If you recall from the earlier lessons, a Call option gives its buyer the "right, but not the obligation", to buy shares of a stock at a specified price (strike price) on or before a given date (expiration date). Selling Covered Call options is a strategy that is best used when stock prices are trending in a channel or rising slightly. It's similar to collecting rent on a house you own. For instance, suppose you were renting your home to someone and you let them "rent with the option to buy." The way these leases work is that the tenant pays $X a month for a set period of time and at the end of that time period they have the "option" or the "right" to buy the home. If they choose not to buy the home then they lose out on all the rent money they paid you. Covered Call options work somewhat the same way. You will first buy shares of stock (buy the house) and then sell or write Call options against the stock (rent your house out with an option to buy). So if you own 100 shares of company XYZ, you would sell 1 Call option to someone giving them the "right" to purchase your stock from you. In exchange for selling these rights, the buyer is going to pay you money. This money is yours to keep no matter what happens in the future. If the option doesn't get exercised, you keep your stock and the money you were paid for selling the option. When someone says, "the option was exercised," they are referring to a buyer of an option exercising his/her rights to buy (in the case of a Call) or to sell (in the case of a Put) the stock. Let's say that the buyer in our example decides to exercise his/her rights. You are then obligated to deliver 100 shares of stock to the buyer at the set strike price. So far in all of the tutorials we talked about buying stock options. Covered call options is now where we begin to talk about being a stock option seller. An option seller receives money from the buyer, and being an option seller, you want the stock option contract you sold to go down in value and eventually expire worthless. This is how sellers make money. When the options expire worthless, they get to keep the options premium they collected. So the person who buys a stock option has "rights," and the person who sells stock options has "obligations." An option seller is obligated to fulfill the terms of the stock option contract. So in the case of Call options, you will be obligated to sell your stock if the option is exercised. Naked: (not covered in this lesson) the option seller does not own the underlying stock that the option is derived from. You would be selling the rights to something that you don't own. Naked option selling has significant risk and is not recommended for novice traders. Covered: the option seller owns the underlying stock that the option is derived from. If the person whom you sold the option to decided to exercise their rights you would just deliver to them the shares of stock you already have in your account. 1 stock option equals, represents, or controls 100 shares of stock. Covered call options deserve a website of their own. It's a fairly simple and straight forward strategy however, there are several ways you can utilize the strategy. The following example is meant to be an overview. As time permits, I will either create a course or an e-book on covered calls. To fully understand how covered call options work, I'm going to go over an actual option chain. For this example I'm going to pull up the snapshot of the option chain that we used in the strike price lesson. 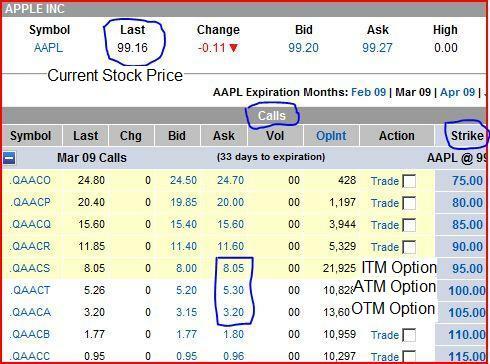 As you can see from the option chain AAPL is trading for $99 a share. Let's assume you own 330 shares of AAPL stock and you bought your shares when AAPL was trading for $80 a share. You decide you want to earn a little extra income from your stock by selling 3 call options (covered call options). So you sell 3 contracts of the March 100 call option to someone. The price of the option was $5.30 or $530. You always multiply the quoted price by 100. So in exchange for selling them the right to buy your stock, they paid you a fee of $1,590 ($530 * 3 contracts). That's it. That's how you sell a covered call. The $1,590 is yours to keep no matter what happens. Yes, it's a bit more involved than that, but as I said before this was just an overview of the strategy. It wasn't meant to turn you into a covered call option pro. So is this where I tell you that you sit back and collect money month in and month out and retire a millionaire? Not hardly! If it were that easy, then everyone would be doing it. [+] The option you sold will expire worthless, which just means that the person never exercised their right to buy the stock. In most cases, this is what you want to happen because you would have made some easy money. [+] You are "called out." This is the term they use when the buyer of the option decides to exercise their rights and buys the stock. Since you sold the covered call option, you are obligated to deliver those shares to the buyer. [+] The stock price drops like a rock and you start to panic because you can't sell your shares. Once you sell a covered call, those shares are now obligated. You can't do anything with those shares as long as that covered call is still an open trade. One way out of this situation is to buy the option back, which then frees up those shares and at this point you could sell the stock. Selling stock options, more particularly covered call options, are what many traders use to generate monthly income from their stock holdings. Trading covered call options happens to be one of my favorite strategies and one that I feel every trader should learn about. All of the strategies I've shown you in this module are only the basics. I recommend beginners start with the basics and then when they become successful with the basics, they can move on to more advanced strategies.